The Danie Craven Stadium in Stellenbosch was packed to capacity as fans gathered to watch the highly anticipated Varsity Cup final between FNB Maties and FNB NWU (Pukke) on Monday night, April 16. The two teams ran out to raucous cheers from 17 123 fans in the stadium. The team from Stellenbosch were loudly supported throughout the game, creating a strong home ground advantage for FNB Maties. Once both teams made a few handling errors and extinguished any nerves they had, FNB Maties took control of the game putting instant pressure on the FNB NWU backline. After three consecutive penalties, the referee finally awarded a penalty try to FNB Maties to open the scoreboard. Three more points were added to the scoreboard by FNB Maties flyhalf, Chris Smith, through a drop kick 10 minutes into the game. However, the first try of the game came through Tiaan Bezuidenhout of FNB NWU which was converted by Schalk Hugo to put FNB NWU onto the scoreboard. The home team went into half-time with a close lead of 10-7. The team from Stellenbosch came out fighting in the second half with an interception from Edwill van der Merwe, leading to a seven-point try for FNB Maties, which was converted by Smith to take the scoreline to 19-7. It was downhill from there for FNB NWU as they were pinned into their own half by FNB Maties who continued to pile on the pressure. FNB Maties scored their second try of the evening through Johan Momsen after overturning a Pukke scrum. Smith converted, to bring the score to 26-7. FNB NWU activated their power play 55 minutes into the game, yet they were unable to capitalise from this advantage. Pukke enjoyed a few rare moments of dominance in the last 20 minutes of the game but again were unable to capitalise from a string of good phase play. The boys from the North West lost focus in the last 10 minutes which FNB Maties exposed with two quick tries. FNB Maties winger, Munier Hartzenberg completed some easy hands to dot down the home sides third try with Smith converting once again, which took the score to 33-7. The final try occurred in the last two minutes of the game through Ricky Nwagbara as well as a conversion by Smith to finalise the score at 40-7. A firework display and a pitch invasion by Maties students cemented the victory for FNB Maties who were crowned the 2018 Varsity Cup champions after a convincing display against FNB NWU. Maties Young Guns also returned home with silverware after winning the U20 tournament of the Varsity Cup series. 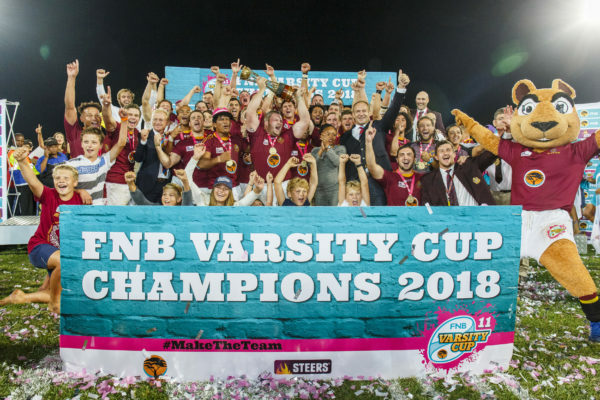 This is the fourth Varsity Cup trophy for Maties since the competition started in 2008, and having lost three finals in the previous five years.